The North American beaver is second largest rodent in the world. A rodent is a gnawing animal. 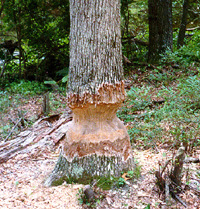 Beavers are located throughout most of North America. Throughout history, it has been trapped for its fur. However, early settlers also ate beaver as part of their diets. During the 1970s, beaver trapping began to be controlled. People can get a license to trap beavers only during a trapping season. Beavers help our environment by creating a system of small dams and canals that helps to stop flooding, that creates marshland, and that stops soil erosion. Beavers pair for life. They start having young by the time they are three years old. It takes more than 3 months for baby beavers, or kits to develop. Beavers can have up to 8 kits, but four is the usual number. Kits are born in a "room" in the beaver's home known as a lodge. Young beavers are born with fur and can swim soon after birth. The mother will nurse her young for 6 weeks, then the kits have to start eating regular beaver food. The young will stay at the lodge for up to two years. Then they leave home and find a new area to live. They leave a smell from scent glands to mark their new home area. Beavers live between 15 to 21 years. 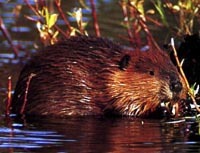 Beavers are found in streams, rivers, and lakes. They use their large front teeth to gnaw through trees and branches. They use them, along with sticks, mud, and stone to make dams in streams. The dam causes water to back-up and flood the land behind the dam. The result creates a marshy type of land. Other fish, insects, birds, and plants begin to take up housekeeping. Beavers do most of their work at night. Within the dams, beavers build lodges that have several underwater entrances. They also build canals leading to their homes. This makes it easier to drag small trees and branches to their lodges. They store this food for the winter months. Beavers do not hibernate. However, they spend most of the winter months in their dry lodges. They come out only to eat tree branches they have stored. Their winter months are spent in darkness because no light enters their lodges. A beaver's diet is simple. It is made up of bark and twigs from trees such as oak, elm, maple, poplar, and birch trees. Because of their diets, they are known as herbivores, or plant eaters.